EAS is all about individual performance. The company's nutritional supplements are designed to bring out the best in athletes and active people everywhere. EAS strives for peak performance in all of its operational areas as well. However it found that one key part of the business, warehousing and order fulfillment, was in need of substantial enhancement. This Golden, Colorado-based company had been shipping orders from an outdated facility that had one forklift and one conveyor line. Orders had to be moved and tracked manually -- an approach not very well suited to a fast-growing organization with customers across North America and around the world. Management moved to address the situation. They knew that they wanted an order-flow system that could keep up with current order volume while having plenty of expansion room for future demand. They wanted a system that was reliable and ergonomically friendly. They also wanted an operation that responded to customer needs in a fast and accurate manner. EAS achieved all of these goals with the opening of a new modem distribution center in Golden. The 141,000 square-foot facility seamlessly integrates a variety of conveyor equipment. It employs the latest scanning equipment and computer controls to ensure shipment accuracy and productivity. It also allows workers to focus on their jobs without having to worry about the risk of injury from heavy lifting or excessive manual handling. "The installation and operation has gone extremely well," says Shelly Phillips Metz, Vice President of Logistics and Distribution for EAS. The facility is processing 1,800 cases a day, she adds, with the capability to handle more. Design and installation of the new conveyor system was a team effort between EAS and FloStor. To meet the critical objective of reliable and continuous flow of product, the team decided on an integrated series of gravity, horizontal power, and live roller conveyors. Other equipment includes power-pivot diverters and ball transfer tables. The order-picking process begins in what are called the "7-Zone Production Lines." 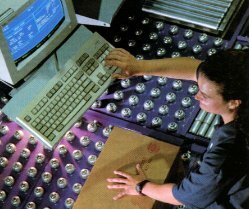 Guided by a touch screen computer and scanners, operators pick orders into boxes that rest on gravity lines on either side of the accumulating conveyor. If there are multiple boxes in an order, the operators are careful to keep them together as a "train." Orders are passed from zone to zone on the gravity conveyors. As soon as a single order or train of orders is complete, they are placed on the takeaway conveyor in the middle. The boxes then move out of the picking zone and through an AccuSort scanner that triggers the power-pivot diverters. 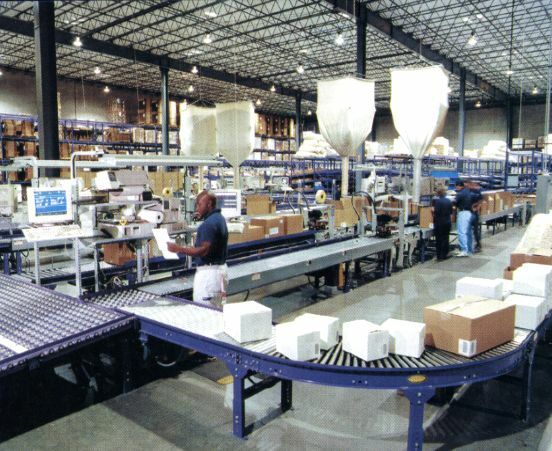 The diverters send the orders down one of four lanes, depending on the shipment method to be used: FedEx, USPS, LTL, and so forth. The first stop for each order is a verifying station. At this point the order is verified, filled, and sealed. The order then proceeds to the manifest stations. Working on ball transfer tables here, operators do a final scan of the order and prepare it for the appropriate carrier. In operation for just over a year now, the new installation has already delivered multiple benefits. "We've experienced higher shipping volume, better order accuracy, and a noticeable reduction in wrong orders shipped," reports Metz. Any order that is received by 2:00 p.m. is shipped out that day -- accurate and complete. The personnel working at the Distribution Center have benefited, too. All of the lifting now takes place in the individual's ergonomic target zone -- that is, from the shoulders to the bottom of the hands. In addition, people on the lines only need to cover 16 feet, keeping walking and fatigue to a minimum. One other important benefit bears mentioning. EAS did not lose a single day of shipping during installation. FloStor was able to manage the project so that shipping could continue on an existing line while the new system was being completed. The teamwork has paid off. EAS now is fulfilling orders at the same peak performance level that its products deliver to customers.